Challenge yourself with a round at one of India’s oldest and most scenic golf courses — Naldehra Golf Club, located 22 km from Shimla, the capital of the present day Himachal Pradesh. Designed and established by the then British Viceroy of India, Lord Curzon, who was so enamored of its beauty that he named his third daughter after it, Naldehra Golf Club is set at 2,200 meters above sea level among mighty cedars. Naldehra Golf opened its initial nine holes in 1905 and with the passage of time later added a second nine. The verdant Naldehra Golf Club course has proven to be a formidable challenge for golfers. Commanding a panoramic view of the Himalayas, the golf course is surrounded by thick woods. The Naldehra Golf Club gives the golfers an added advantage of playing longer hours than they can in the plains thanks to the lower temperatures recorded in the mountainous region of Shimla. Put simply, the Naldehra Golf Club offers all the luxuries fitted that make playing golf an unforgettable experience. 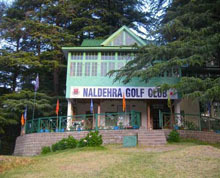 Naldehra Golf Club offers a drink and snack bar. Adjacent to the course is located an ancient shrine.